Guests booking Villa Kailasha will hopefully have spotted that it’s in a remote location so there should be no surprise on arrival: we certainly thought the villa’s setting was sublime. Long stretches of black sand and marauding surf with hardly another tourist in sight. We spent most of our time stretched out by the pool enjoying the ministrations of the staff and soaking up the ocean views, but while we were there we were privileged to witness a village ceremony when the procession passed right by the villa’s front gate. We followed the merriment and colour down to the beach and experienced a Balinese event that, for us, was priceless. For a change of scenery, take a stroll along the small roads and into the local villages for a slice of rural life. And for something a little more sophisticated, stop by the Alila Villas Soori Resort for dinner, or at least a sunset drink. The classy surroundings are pretty special and being so remote not many people drop in, so don’t miss the opportunity while you’re in the neighbourhood. We went for the said sunset drink but ended up staying for dinner – and really rated their kitchen. While their spa would probably welcome visitors as well, it’s perhaps more tempting to ask the villa staff to organise a therapist to come and give you a treatment at ‘home’. Wow! 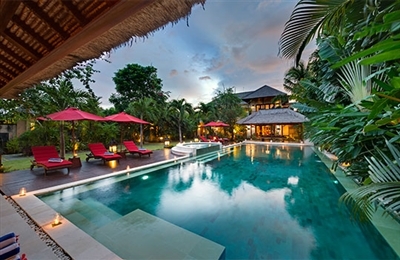 Villa Kalimaya I was a surprise from the moment we opened the gilded Balinese doors and stepped into its garden. Yes, garden! 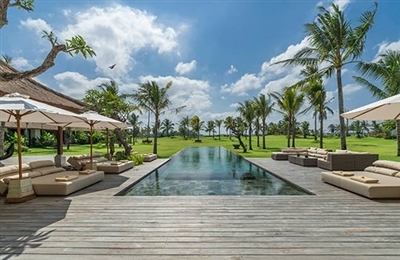 Not a handkerchief-sized patch eaten up by a pool, as is the case in so many villas in densely built Seminyak, but a huge expanse of lawn edged with travellers palms, hibiscus and frangipani trees – big enough to lose three guest bedroom pavilions which were completely camouflaged from view! While there are two huge living rooms and an indoor dining room within the main house, we spent most of our time idling on over-sized cushions in the large poolside pavilion, and chose to take our meals alfresco. Speaking of meals, the cook whipped up a delicious Singapore laksa for us – apparently a doddle for him as he regularly prepares gourmet dinner parties for 20; no wonder most guests forego the pleasures of the many fine restaurants within an easy walk of the villa in favour of his home cooking. The cook, butlers and housekeepers – all charming and helpful – divide their time between all four Kalimaya villas set along the same quiet lane. We considered this a bonus as it means guests benefit from a professional team, but privacy is not compromised by their continued presence. We appreciated that Kalimaya has been designed as a home – originally for entertaining her royal friends, the owner told us. Comfortable, well equipped and full of personal art and furniture collections, the place feels larger-than-life. This is the perfect villa for an extended family or groups of friends who want to be sociable and yet still be able to get away from each other; the bedrooms are large and designed for privacy, there are lots of different seating and dining areas, and we were still discovering discreet get-away-from-the-crowd hideaways right up to our departure. When we first opened the gilded Balinese doors into Villa Kalimaya IV, we were immediately taken with the large pool that runs the length of the garden, with its huge jacuzzi, infra-red sauna, sunbathing deck and imposing raised balé. The element of surprise was maintained throughout our visit, as we discovered not one but two living rooms as well as a second dining area on the upstairs terrace – an extraordinary amount of space, especially in such a hip Seminyak hotspot. This is a really well-designed, well-furnished villa with a lot of extra details to ensure a comfortable, cossetted stay. With the pool area to frolic in (plus four TVs and DVD players), there was plenty to keep us occupied without making use of the complimentary Canggu Club membership. And when we did step beyond the villa walls, we were on the beach or in Seminyak’s best restaurants and boutiques within minutes. This is the perfect place for a family or group of friends who want to be sociable and yet still be able to get away from each other. The room configuration is good for families as one of the two upstairs bedrooms has twin beds – perfect for the kids – while the downstairs bedroom will suit the grandparents (or older kids returning from a night on the town). 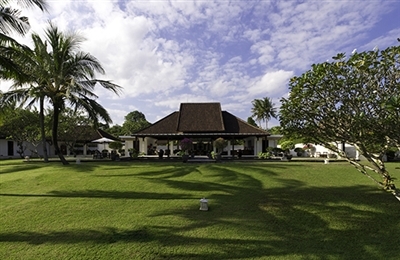 The cook, butlers and housekeepers – all charming and helpful – divide their time between this and the other three Kalimaya villas along the same quiet lane. We considered this a bonus as it means guests benefit from a professional team, but privacy is not compromised by their continued presence – and it means that self-catering is a personal choice, not a prerequisite.